Seventy years ago, as India and Pakistan gained their independence, the region of Jammu & Kashmir also found itself divided, with parts of the territory administered by Pakistan ever since. Located by the volatile Line of Control and caught in the middle of artillery barrages from both ends, Pakistan-administered Kashmir was until over a decade ago one of the most closed-off territories of the world. In a first book of its kind, award-winning Pakistani writer Anam Zakaria travels through Pakistan-administered Kashmir to hear its people - their sufferings, hopes and aspirations. She talks to women and children living near the Line of Control, bearing the brunt of ceasefire violations; journalists and writers braving all odds to document events in remote areas; political and military representatives championing the cause of Kashmir; former militants still committed to the cause; nationalists struggling for a united independent Kashmir; and refugees yearning to reunite with their families on the other side. 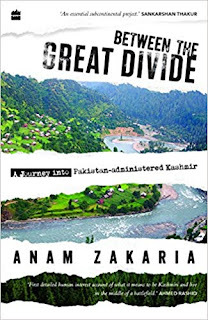 In the process, Zakaria breaks the silence surrounding a people who are often ignored in discussions on the present and future of Jammu & Kashmir even though they are important stakeholders in what happens in the region. What she unearths during her deeply empathetic journeys is critical to understanding the Kashmir conflict and will surprise and enlighten Indians and Pakistanis alike. Anam Zakaria is a researcher, development professional and educationist with a special interest in oral histories and identity politics. She has a particular interest in trauma and healing in conflict zones. Her first book, The Footprints of Partition: Narratives of Four Generations of Pakistanis and Indians, won the KLF-German Peace Prize 2017.